Linda Hafskjold disputerer 3. desember. Avhandlingen har fått tittelen "Older persons’ worries expressed during home care and supportive communication - analysing audio-recorded visits". "Gi en oversikt over psykososiale teorier om aldring, og drøft deres anvendbarhet i forsking og klinisk praksis med hjemmesykepleien som kontekst." 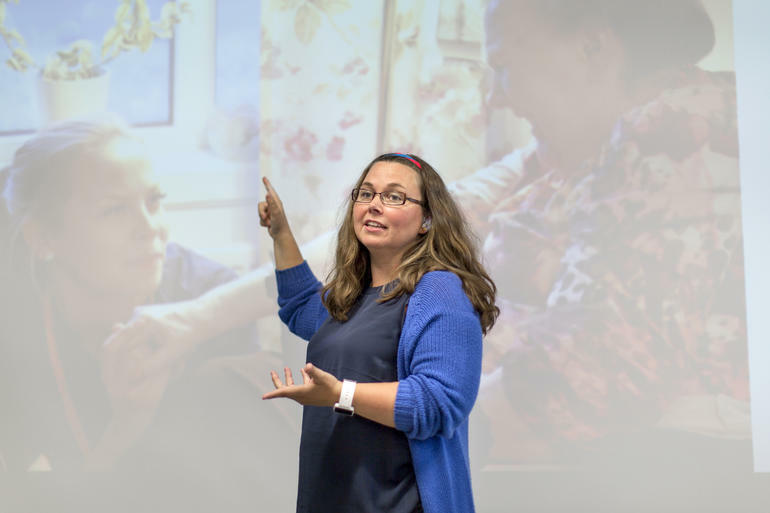 This thesis reports on findings conducted as part of the COMEHOME-project, an international research project aiming to explore features of clinical practice and care for older people with relevance for person-centred communication. The focus of this thesis was to explore how older persons verbally express their worries and the nursing staffs’ immediate response to these expressions during home care visits. Main findings show that usually older persons express their worries as hints to distress rather than as explicit statements where the emotion is named in the conversations with nursing staff during the home care visit. By using a qualitative two-step approach, topical content of expressed worries were classified into four main topics: 1) worries about relationships with others, 2) worries about health care-related issues, 3) worries about ageing and bodily impairment, or 4) Life narratives and value issues. The main topic of “worries about ageing and bodily impairment” amounted to 66% of all expressed worries during home care visits. This topic covered issues like coping with reduced bodily function, fear of dying, and living with little hope for the future. The four main topics are likely to be important to consider when deciding on areas to strengthen to support implementation of the national policy of “Living your whole life” (HOD, (2018) Leve hele livet), given that these issues are assumed to reflect important issues for older people living at home. Turning focus to nursing staff’s response behaviour showed that nursing staff are more likely to focus on and allow elaboration of the affective component of the worry when they elicit the worries themselves and when the expressions include a reference to an emotion. This pattern was unrelated to the status of being a nurse or a nurse assistant. Moreover, topical content was associated with how nursing staff respond to worry expressed by the older person. Analysis of sub-topics within “worries about ageing and bodily impairment” showed that when the older person worried about existential challenges, the nursing staff relatively more often focused on the affective component of the worry comparing to worries about expressions of pain felt in the moment. This last topic received relatively more ignoring/blocking responses. Within “worries about relationships with others”, analysis showed that feeling like being a burden were relatively more often responded to with a content-focused response, whereas when responding to expressions about losing social ties the nursing staff focused on the affective component of the worry. Drawing on theory describing comforting and supportive communication in daily life, allowing a person to share and elaborate on his/her worries and concerns helps to support a person who is experiencing emotional distress. Supportive communication have beneficial health effects like increased coping and reduced stress, and increased well-being. This is also linked to better health outcomes for older people in particular. The sample included 195 visits collected from four units of home care, three located in one city and one located in a rural municipality in Norway. Both nurses and nurse assistants had a recorder on their upper arm while they performed their tasks. The audio recordings represents the material analyzed in this study. The Verona Coding Definitions of Emotional Sequences (VR-CoDES) was used to identify expressions of distress and the subsequent responses by providers. Two coders applied the system to the complete material. The inter-rater reliability, Cohen’s kappa, was >0.6. Data were subsequently analysed using both a qualitative and a quantitative approach. Drawing on the qualitative analysis, a coding scheme for thematic content in patients’ expressions of worries was developed.